Bimal Gurung today announced there would be no agitation in the Darjeeling hills in a turnaround two months after he told schools in the region to hold exams earlier than scheduled. At the Darjeeling Motor Stand meeting, the Gorkha Janmukti Morcha chief said: "I had thought of holding some component of the agitation in the hills, but looking at children preparing for examinations like ICSE, ISC and Madhyamik, I have decided to cancel the agitation in the Darjeeling hills." School exams are generally held in mid-November and many schools have completed their annual exams. But Gurung's categorical announcement and his silence on making good his threat to quit as the head of the GTA could bring relief in the hills for now. The Morcha, while not specifically announcing an agitation plan in the hills, had said an indefinite hunger strike might take place if the Union home ministry does not hold a meeting to look into the demand of forming a committee to examine the demand of Gorkhaland by December 5. Gurung's statement today gave an indication that the Morcha did not want to antagonise the Centre just after it had shown some movement regarding the grant of ST status to 11 communities. Gurung today said he was hopeful of a Union home ministry meeting soon. "The Union home minister, Rajnath Singh, had gone to Cuba for the funeral (of Fidel Castro). He returned only yesterday and we are confident that the meeting will be held soon," he said. The Morcha chief seemed to be banking on the formation of a committee to examine the demand of statehood and also for a favourable report on the demand of granting the Scheduled Tribe status. "We are expecting the committee (headed by Vishu Maini, deputy director in the ministry of tribal affairs) to submit its report in the next 15-20 days. 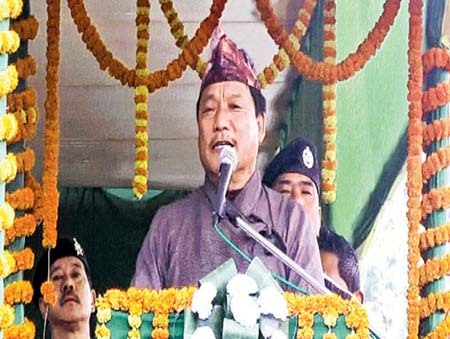 We are confident the bill will be placed in Parliament during the monsoon session," Gurung said. Even though Gurung was optimistic on both the tribal and statehood committees, he was a bit cautious in his proclamation. "As announced earlier, the agitation in Delhi will take place from December 12 to 16. If there are no positive outcome by then, we will not hesitate to announce an agitation in Delhi from December 17," he said. Sources in the Morcha said the party is planning a two-day dharna at Jantar Mantar on December 12 and 13, followed by two days of relay hunger strike and a rally on December 16. Impressed by a good turnout at the Darjeeling meeting today, Gurung attacked Mamata Banerjee and the Jana Andolan Party president Harka Bahadur Chhetri. "The impressive turnout today is a reply to Mamata Banerjee's oppressive and divisive politics. She has been creating divisions, not just in the hill communities, but now even among the minorities such as Muslims and Christians. People, however, understand everything these days," Gurung said. He accused Mamata of coming to power in 2011 with "the chit fund money of Saradha" and also protested her allegation against the army. "Her statement against the army is uncalled for. The Centre must speak on this."